WINSTON-SALEM, N.C. - Pablo Carreno Busta’s time has finally come. The 25-year-old Spaniard claimed his first career ATP World Tour title Saturday afternoon at the sixth annual Winston-Salem Open, as he fought back to beat second-seeded Roberto Bautista Agut 6-7 (6), 7-6 (1), 6-4 in an all-Spain final on Stadium Court. Carreno Busta let two set points slip away in the first set and was a break down in the second set, but he roared back and handily won a second-set tie-break. Then he was clearly the fresher and stronger player in the third set, getting the only break he needed to go up 3-2. 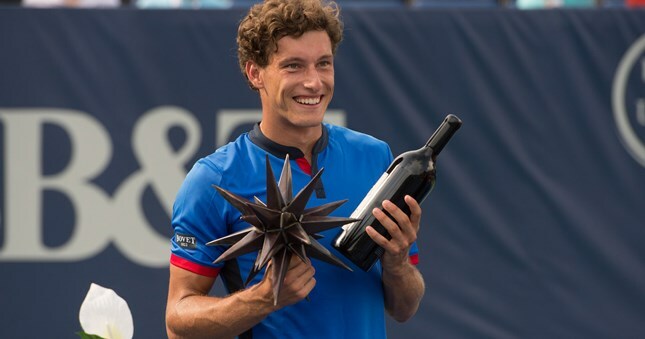 Carreno Busta dedicated the victory to his family, who encouraged him to move from his hometown of Gijon, Spain, at age 15 in order to train in Barcelona. Carreno Busta came into the tournament ranked No. 49 as the tournament’s No. 16 seed. He had beat Jan-Lennard Struff in the second round, upset third-seeded Pablo Cuevas in the third round, beat 12th-seeded Andrey Kutznetsov in the quarterfinals and John Millman in the semifinals. He came into the final without losing a set the entire tournament. That changed when he allowed two set points to slip away at 6-4 in the first-set tie-break, as Bautista Agut won the final four points to claim the set. Carreno Busta then had to come back from a break down in the second set, but he was dominant by winning seven straight points in the tie-break. In the third, he got the only break he needed to go up 3-2, and then it was a matter of holding serve three times from there. He had a hard time recollecting the events of the final set because he said he was so nervous with a title on the line. He had been just 4-7 this year previously in decisive sets. Carreno Busta will likely move into the Top 40 when the new ATP World Tour rankings are announced on Monday. He’s having the best year of his career, with trips to the finals at Estoril and Sao Paulo earlier the year. He had reached the semis in Los Cabos two weeks ago. Bautista Agut was looking for his third title of the season and the fifth of his career, coming into the tournament ranked No. 17. He had been a wildcard entry, deciding at the last minute to enter the tournament after losing in the first round in Cincinnati last week. He had a tougher path to the final than Carreno Busta, as he played three three-setters along the way. He rallied to beat Aljaz Bedene in the second round, 14th-seeded Marcos Baghdatis in the third round and endured a bizarre three-setter against ninth-seeded Viktor Troicki in the semifinals. His only easy victory all week came over Yen-Hsun Lu in the quarterfinals. Bautista Agut was making no excuses, though. In the first match, the team of Guillermo Garcia-Lopez and Henri Kontinen pulled off a spectacular comeback to win the doubles title with a 4-6, 7-6 (6), 10-8 victory over Leander Paes and Andre Begeman. They fought off six championship points in the second-set tie-break, rallying from a 6-1 deficit, then dominated the third-set tie-break. This was Kontinen’s 10th career ATP World Tour doubles title and his four of this year. He had teamed with John Peers to win in Hamburg, Munich and Brisbane earlier this year. It was Garcia-Lopez’s third career doubles crown. The two were playing together for the first time this week because Peers wanted the week off before the US Open and Garcia-Lopez’s normal doubles partner is Carreno Busta. It was a heartbreaking defeat for Paes, who was looking to win his 56th career doubles title. He would have extended his streak to 20 straight years with at least one doubles title with a victory.